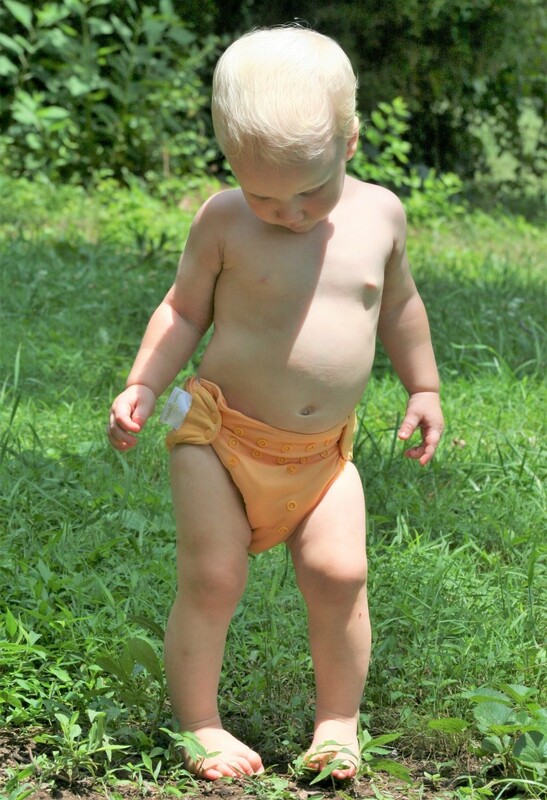 Cloth Diapers…they kinda go hand in hand with self-sustainability, homesteading, and save the earth mindsets. But in all honesty, I did it so diapers would quit sucking the ever loving life out of my budget. Yes, obviously they are more time consuming, but I am willing to give my time in replacement for money saved. I am a stay at home mom and I hang on for dear life to the saying “a penny saved is a penny earned.” To be frank, I love cloth diapers and I don’t even notice the time it adds to my week. Not to mention, I think cloth diapered buns could be the cutest thing ever! Reader beware: bodily fluids/functions and the like will be discussed below. I think I can spare the poop pictures though. I will just leave it to your wonderful imaginations. Our first child had disposable diapers beginning to end. So no judgement here for anybody out there using disposables. That also means I know the convenience of disposables. When our second came along I stopped working, I had been working part-time up to that point. Needless to say our budget was tight after that and with two in diapers it was a stretch. Around the time Autumn was six months old Alli was potty trained. One baby down. When Autumn was 10 months old, I started looking at cloth diapers as a way to save money. The more I read about cloth diapers and the amount of solid waste that goes to landfills every year just from one baby’s diapers, the more it became about making our footprint smaller and less about money. Not that money wasn’t important, it just became a bonus instead of the front runner as far as my desires were concerned. So now that I had decided cloth diapers were gonna happen….where do you start?? I mean, there are only 60 different kinds/makers out there. Who do you trust? Is it going to leak? Is it going to fit? What does AIO mean? What does pocket diaper mean? Chinese prefold? Indian Prefold?? Okay, Jessica, stop hyperventilating. Just read the reviews. Is it just me or does every product have reviews with people who love it as well as people who hate it??!! I couldn’t even trust the reviews. They were so contradictory from one review to the next. I finally just decided to pick one and move on with my life. At the time (5 years ago) I had FuzziBunz in a cart waiting for payday. I was still a little apprehensive to purchase them just because there were so many mixed reviews. I work in the nursery at church, and when I saw a visiting mom changing a cloth diaper…I….um…well jumped all over her. A real, live person…heck yes. Why I thought I could trust her more than the people online I have no clue. But there is something about person to person exposure. She was so sweet to answer all my questions and then I hit her with the big question. What is your favorite diaper? I only had one shot and I needed to get the right diaper the first time. None of this try it out stuff. She said bumGenius pocket diapers were her favorite. I had never heard of them, and like the good “Suzie Homemaker” that I am… I looked them up. I devoured their website, Cottonbabies, which to my knowledge is the cheapest place to purchase them as well as many other brands. Most of the reviews I read were great, a lot of people said they were so good they used them for their nighttime diaper. Nighttime is when you need the best diaper due to a longer period of wearing, if it’s the best why would you choose a different diaper for daytime hours? It still kinda baffles me. After researching it was a pretty quick decision for me. I bought 12 bumGenius 4.0’s one size (adjustable 8-35lbs) diapers and three packages of laundry powder for right at $250. The soap ended up lasting me almost a whole year. I promise you can’t buy a year’s supply of diapers for $250! Autumn was 11 months old when they arrived and I was so excited. Why I decided to try the diapers out for the first time in public is still a little fuzzy to me. None the less, I did it. 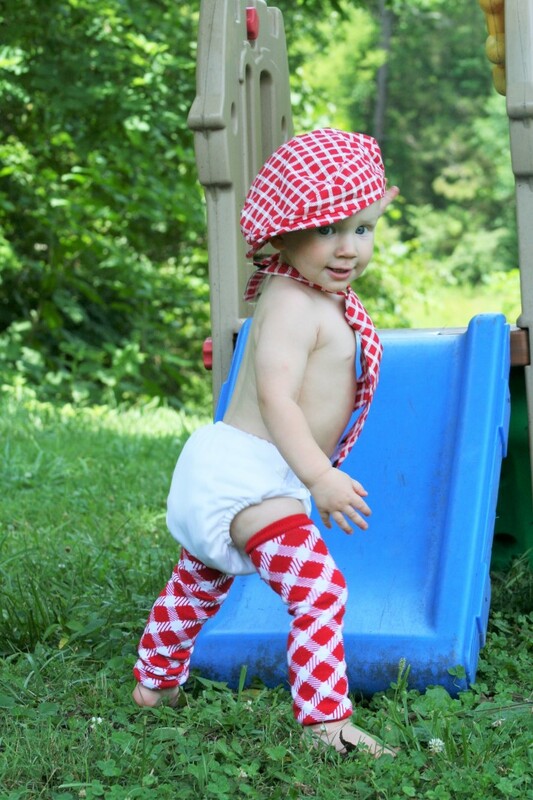 If you are used to disposables, the shock of how …um…bulky cloth diapers are can throw you off. Autumn had on this cute little outfit and her pants almost didn’t fit if I stuffed the diaper how it came. One large pad and one small pad. I decided that she didn’t need it stuffed for nighttime so I put the small pad in, which I discovered later is meant for newborns. Bad idea. When I arrived at our destination she had peed out of her diaper. Good job mom. From then on I would put the large pad in, but if I left her in the diaper for more than 2 hours her diaper would leak. So I went to researching, maybe I was doing something wrong, like not having it sized right or something. Turns out I had what was called a heavy wetter. I packed her for night all day every day. Problem solved. Double thankful I got the “go to” nighttime diaper for all of my diapers. Something that should be noted with cloth diapering is that pant/shorts will probably need to be a size up if you are having to pack for night around the clock. After a week or so the bulky buns didn’t bother me at all, actually I think it’s pretty cute now! Now 12 diapers will barely keep you in the game with an older baby. 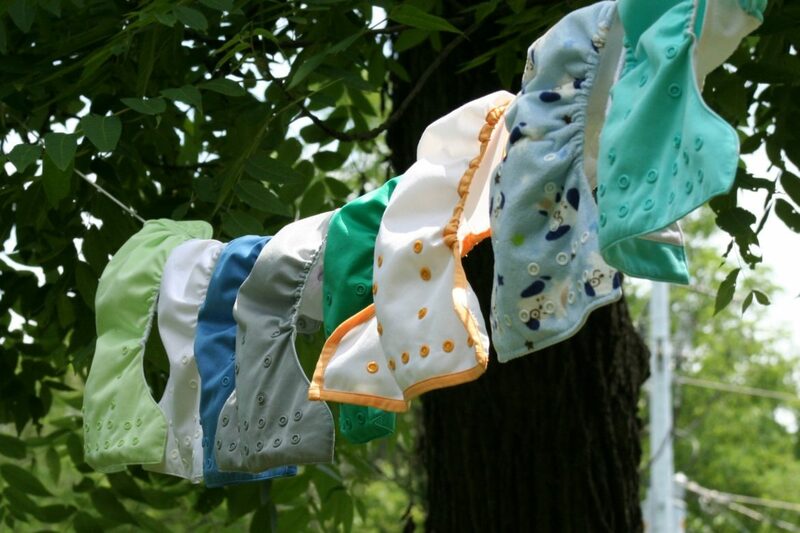 I washed diapers every day…why? Because we couldn’t afford to buy more, so we got away with the minimum. If you are starting cloth diapers with a newborn you will most definitely need more than that, they just go through more diapers than an older baby. When our third came along I was so excited to get even more bang for my $200 bucks spent on Autumn’s diaper stash. Obviously I knew I would need more diapers this go around since we would be starting with a newborn. If I could have afforded it, I would have bought all 4.0’s but I was trying to be budget conscious. In the end I ordered three one size 4.0’s, three Econobum one size covers, three Econobum newborn covers, a 12 pack infant Indian Prefolds and a 12 pack regular Indian Prefolds. Essentially 27 diapers for $250. The covers go over the prefolds, for those of you who are new to cloth diapering. Prefolds were technically something I never wanted to try, I thought it was more work in putting the diaper on. Sometimes cash is king, and cash said we “needed prefolds” for budget sake. In the end, I prefer prefolds at home and at night, they just do a better job of holding a ton of pee. Told you we were going to talk about bodily fluids, hopefully you can stomach it though. Out and about I definitely prefer my 4.0 pocket diapers. They act just like disposables in my opinion. I could have saved myself $25 if I hadn’t bought the Econobum newborn covers. I didn’t really think about it, but with a boy the first few weeks you are definitely going to use disposables if they are circumcised. Logan was a pretty big baby when he was born, 8lbs 7oz, so by the time he recovered from his circumcision he was too big for the newborn (which are one size only) covers. I still used the infant Indian Prefolds with the one size Econobum covers, so not all was a loss. I would highly recommend bumGenius for any budget, Econobum is their thrifty line that utilizes prefolds to save money. A few other brands that I have been gifted with are Kawaii, “G” Diaper, and Thirsties. Kawaii are a one size pocket diapers which are very similar to bumGenius and I like them a lot. A friend purchased them from Amazon for Logan. “G” Giapers. These are “sized” diapers so you would have to get small/medium/large for your baby. That is probably the only thing that I don’t prefer about them. “G” Diapers actually did a lot better than I thought they would. They have a plastic liner that holds a pad, and honestly I didn’t think it would be able to hold the poo in. But Logan has tested the limits quite a few times and it has held up. Thirsties is similar to the Econobum and has a prefold and is also available on the Cottonbabies website. Some expenses to think about: you will definitely need a small wet bag for your diaper bag. Yes, you could use grocery bags but honestly it’s going to get old when you run out of bags. I did not want to purchase a $50 dollar trashcan that I would have to buy liners for and carbon filters. When I was only dealing with 12 diapers I used a large wet bag and it worked just fine. Bonus was it was reusable and washable. When I purchased more diapers for Logan’s arrival I just bought another bag and it works great switching them out when one is full. Now if you had twins or something along those lines, I could maybe understand the need for the trashcan system. I also purchased cloth wipes because it’s easier to just throw it all in the wash than it is to fish out yucky, used disposable wipes to put in the trash. I personally do not own one or have used one but I know many who use the diaper sprayers that hook up to your toilet. They all have said they are a great help with the “awesome” diapers. WARNING…graphic descriptions used ahead. Up to this point I have been pretty lucky in the fact that most of the poo…..well….um “plops” out. Too graphic?? Sorry. There have been plenty that I save for when daddy comes home and let him take a hose to them… outside. So in hind sight, I should probably get one. I just haven’t gotten that far yet. If you are looking for help in the form of “how to”, Cottonbabies has a very thorough section that answers just about any question you can think of. From how to keep your warranties, how to wash them, how to sanitize…etc. I have spent many an hour soaking up the knowledge on that page. Just for anyone wondering, I do not receive any kind of remuneration for my links or suggestions above. These are the products I have used personally for the last five years. I just remember when I was trying to sort out my diaper dilemma I just wished someone had written their reviews with some experience behind them. The people who liked it had generally only been using them for a couple of week. And the people who hated them most times hadn’t used them for very long either or bothered to find out that maybe they had a heavy wetter or used the wrong detergent and were just plain mad. Here is to hoping this is helpful for someone in need!